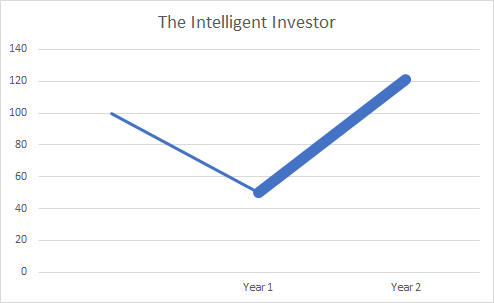 Many experienced fund managers have told us it is impossible to coach your investors (partners, participants) to make Intelligent decisions about when to invest more or when to take money out of the fund. In industry jargon the "time weighted return" of a fund is usually higher than the "money weighted return". We would like to attempt the impossible, run a fund where the money weighted return is higher than the time weighted return. $10 million start, no money taken out or put in. Time weighted return is money weighted return. The returns for the investors are on average 10% per year, 21% after 2 years. $10 million start, almost $10 million taken out after 1 year. 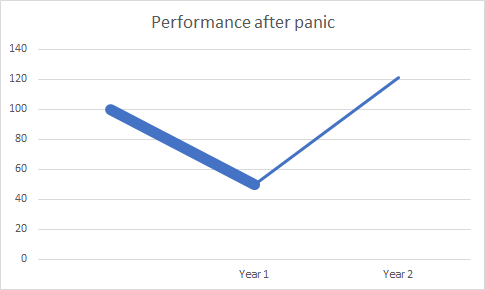 Time weighted return is 10% per year, 21% after 2 years. Money weighted return is minus 50% after 1 year and after 2 years. The fund manager has picked the exact same stocks, but has failed to make it clear to investors that the end of Year 1 was not a good time to sell. In fact Warren Buffett says that a good time to buy stocks is after a dip: "Be greedy when others are fearful." Almost no money at start, $10 million invested after 1 year. 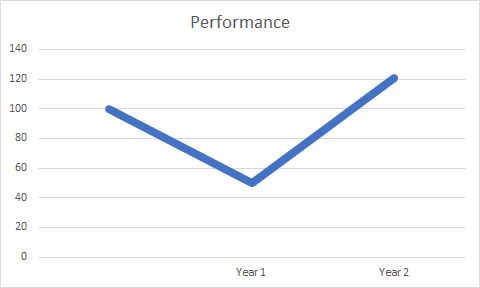 Time weighted return is 10% per year, 21% after 2 years. Money weighted return is 55% per year and 242% after 2 years.